Affordable housing. Transportation. Over development. Crime. Taxes. According to the VoteLocal survey of Metro Vancouver residents, businesses and civic politicians, released in early September, these five topics were identified as the most important issues facing local communities in the lead up to the October 20th municipal election. It comes as no surprise that affordable housing came out on top. More concerning was our finding that almost half the region’s residents and over a third of its businesses say they have recently considered moving away from the region due to affordability concerns. Residents and business owners expect affordability and quality of life to get worse over the next five years, however municipal politicians are more optimistic. VoteLocal is a unique research project that compared the views of the public, businesses and politicians, and was conducted by Mustel Group and FleishmanHillard HighRoad, in partnership with the Greater Vancouver Board of Trade. It provided a snapshot of opinion before the civic election campaign really got going in mid-September. So we asked ourselves: Have the top issues we identified in our survey turned out to be the topics most talked about on the campaign trail in this final week of the campaign? What can we learn from the chatter on social media, where a lot of the debate (good and bad) tends to take place in relation to elections? To get a better idea of the big picture of the online discussion, we generated word clouds for each of the top-five topics. This allows us to see key terms that came up for each issue and better conceptualize their frequency. As a way to measure public interest in individual issues, social media is certainly not perfect. 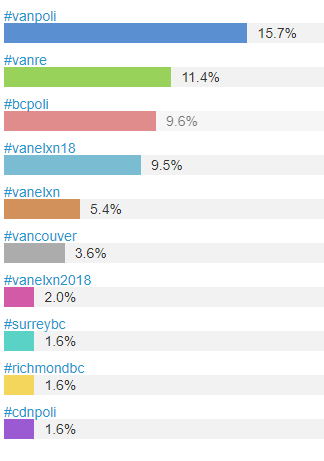 But it’s telling that transportation issues (particularly related to public transit projects like the Millennium SkyTrain extension down Broadway, Surrey LRT, and bike lanes) are eclipsing housing in terms of the online debate. We’ll be publishing more content at www.votelocalbc.ca in the final countdown to voting day. Here’s hoping that discussions about the election – whether online or offline –translate into a good turnout at the ballot boxes on October 20th. Anna Lilly is Senior Vice President and Partner with FleishmanHillard HighRoad, one of B.C.’s leading public affairs and strategic communications firms. Evi Mustel is Principal of Mustel Group Research, a leader in opinion research and analysis in B.C. for the past 25 years.